Alexander Wang. Proenza Schouler. Zac Posen. New York has the names, and Anna Wintour. Can Los Angeles fashion ever compete? Finally, thanks to The Los Angeles Fashion Council, the land criticized to wear only flip flops, jeans, and Ed Hardy T-shirts finally has a fighting chance to prove that we really do have style. Well, maybe not in the South Bay. The LAFC was founded in October 2011 and has provided significant opportunities to the movers and shakers that keep breathing life into the fashion scene, including sending local designers on a trip to London to showcase their creations! 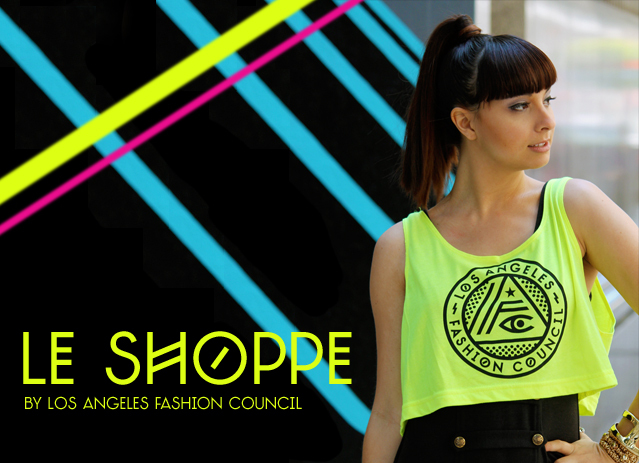 That’s not all, hot off the presses, with the help of the team at ASOS Marketplace, the LAFC and local LA designers have launched “Le Shoppe” by Los Angeles Fashion Council. Representing culture far beyond the Dodgers and celebrity home tours, the online store features the work of some of the designers LAFC took to London; Alana Hale, Jen Awad, Curly V, The Bohemian Society by Victor Wilde, Sires Crown Eyewear, Kittinhawk and Bijou Van Ness. In true LA style, the collection also features Los Angeles Fashion Council original t-shirts. The photography for the boutique was shot on the streets of downtown LA, by LAFC Director and Founder, Kelsi Smith. The collections, which are now available for the first time on retail, were modeled by some of our best local fashion bloggers from L.A bloggers organization Two Point Oh! LA including, Olivia Lopez of Lust for Life for Alana Hale, Lux Leonard of Lux Likes It for Jen Awad, Chanelle Laurence of The Penelope Times for Curly V, Jenny Wu of Good, Bad and Fab and Peter Adrian of The Hobbyist for The Bohemian Society, Bethany Struble ofSnakes Nest for Kittinhawk, Marie Legette of The Curvy Fashionista for Bijou Van Ness and again, Peter and Bethany for Sires Crown Eyewear. Talk about a party! Behind the scenes of the shoot were local fashion stylist and DIY blogger, Kristen Turner, Carlos Ramirez on make-up and Diana Lomelin on hair. – Kelsi Smith, Los Angeles Fashion Council Director and Founder.